Lets talk about food today, about one of the cornerstones of the traditional Mediterranean diet: olives. In Spanish they are called aceitunas derived from aceite which means oil. In Catalan we call it olives too, with the stress on the i, being oli the word used to designate such oleaginous liquid. The scientific name, Olea europaea, speaks for itself about the final product obtained from the fruit and the origin and habitat of this tree. 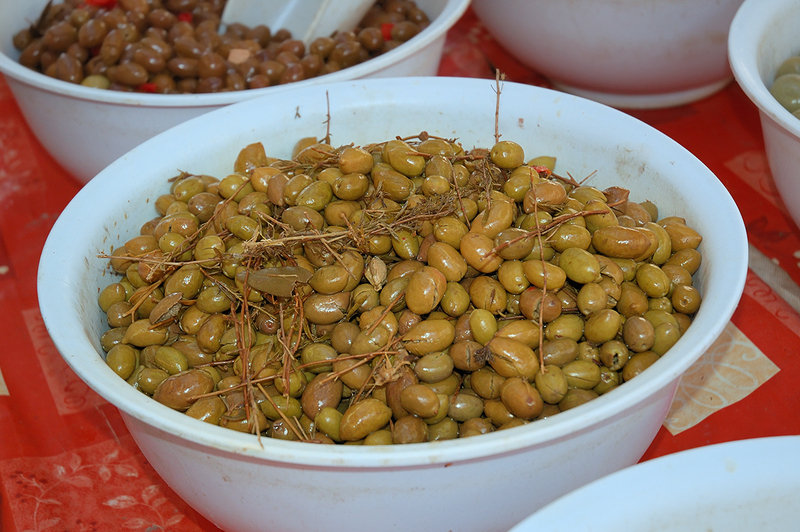 There are different kinds of olives with some peculiar names many times conditioned by the region where they are grown. Green olives as the name suggests are picked from the tree before they ripen. Black olives are then the ripe ones, to be more precise, those ripened on the tree. There are about 14 varieties classified in Spain: Blanqueta, Callosina, Arbequina, Gordal sevillana, Cornicabra, Manzanilla cacereña, Villalonga, Serrana de Espadán, Morrut, Changlot Real, Canetera, Alfafara, Hojiblanca, Carrasqueño de Córdoba with a whole lot of local synonyms. No need to say that other countries in the Mediterranean like Italy, Greek, Syria, Turkey have their own. Before serving the olives, some preparation is required to get rid of their normal bitterness. You may buy them canned or bottled but there's the possibility of dressing them on your own. Green olives like the ones you see in the image, acquire that final salty spicy flavor from the extra ingredients people put into the dressing. Don't bother taking those in the bottle to make your own home-made concoction. You need them clean to start with, without previous treatment although it says they are salt free. Once you manage to buy them free of salt, you put them in water to get rid of the bitter taste, change the liquid every 12 hours till the greenest of them tastes sweet. If you don't cut them into halves or squeeze them first the process will take longer. The more you squeeze the shorter the time. The container where you place the olives must not be made of metal nor should you use any metal object or your hands to remove. Once sweet, they are ready to take that dressing. The dressing is applied by layers and shall cover the content. They will acquire maximum flavor in about a week. The ingredients depend on you although there is a certain limitation of course. You may use garlic, thyme, laurel, oregano, paprika, cumin, fennel, orange shells. Remember the basis is water but you can add lemon and/or vinegar. I am not a cook myself and cannot take responsibilities for the right results here but in essence, you may come up with some tasty aceitunas aliñadas in the end. Your photo and commentary has started an olive craving for me! It's so hard to get the great ones over here! You're so lucky! Yum yum. That was fast! How did u find me. Twitter? What, I didn't know that, about green and black olives!! I thought they came from different kinds of trees. And what makes the different shapes? (small round vs big oval) Is THAT because of different trees? Mmmmm, I LOVE olives..... my favorite are the black, wrinkly, super salty kind. Great image and such interesting information. I had no idea of the preparation for green olives. A local grocer in our town has an "olive bar" with a nice variety of olives. They are quite expensive, and now I understand why! Barb, never been near Rota. Well, I have been in Huelva, Doñana park which is near, but never in Rota, Cádiz. Nice places to visit and eat! Hi Lydia. I didn't know olive oil was that extended now. I always thought you would prefer other kinds like sunflower oil. Where is it from? Italian or Spanish? Olive oil is excellent for salads and much healthier. We use sunflower for the deep fryer only. Carlos said this: I liked all the great comments but I decided to quote you cause your blogger profile is not available. Thanks for your patience and understanding. Now you really made me drool big, because olives is one of my passions!!! I can't live without them. Though it's very difficult to find really good ones. I don't like when they stuff them with anchova though, which often is the case in Spain, I've noticed. I had no idea that you had so many different ones over there. I'd love to taste them all.